Property 1: Mountain Rustic Log Home Vacation! Property 4: Mountain Guest House Vacation! 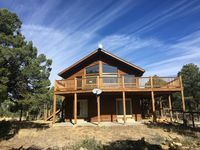 Property 5: Home w/ San Juan Mountain Views-2 miles to Ouray! Property 11: Beautiful 2 Bedroom, 2 Bathroom With Indoor Hot Tub! Property 12: Sneffels Retreat! Enjoy Amazing Mountain Views in Peace & Comfort! Views, Views, Views, Quiet, Private Country Living. Property 26: Views, Views, Views, Quiet, Private Country Living. 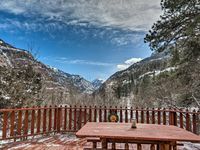 Property 28: Large Quiet Mountain Home Close to Ouray. Such a wonderful, quiet, little place in the trees just outside of town. Views from the sunny deck were just awesome. The decor was quirky and fun and the beds were very comfortable with an open living space giving us plenty of space to entertain while making a special meal with many cooks in the kitchen. To cut down on the dish washing, just bring a few paper plates although the kitchen is well stocked. Brock, the caretaker was so kind to go out of his way to hang a Happy Birthday banner and leave a nice bottle of champagne for us. He also stopped by to see if we needed anything and was ready to help shovel more since it snowed a bit overnight. Thanks again Brock and yes, I definitely recommend this place to others. Well maintained and updated home! Quiet area! Excellent property that is updated and well maintained. Plenty of space for a large family or 2-3 smaller families. The description well matches the actual home. The owners are repressive and attentive. Take note of the location and time to travel to key areas/stores. This is a great quiet neighborhood with amazing views of the stars at night. I would recommend this location! Also Jake and Evisa can give you recommendations on family friendly restaurants in nearby Telluride.